Cassata is an Easter Italian Cheesecake. This is my mom's recipe the late Margaret Ann Fanelli Colenzo. You're in for a real traditional Italian creamy ricotta filled cheesecake that is bursting with cherries and chocolate! Cassata siciliana is a traditional sweet from Sicily, Italy. Mom was from Bari, Italy and this is her version. There are six, seven, maybe 10 different varieties of cassata in Italy. The cake is believed to have originated in or around Palermo, where sheep’s milk ricotta, pistachios, and citrus were prevalent. The Italian cheesecake is a moistened with ricotta cheese baked into a delicious crust that has fruits and chocolate in it. It's a tradition in our family to make this cheesecake every Easter, everyone looks forward to it. Over the years, we preferred it without some of the traditional candied fruits in it called citron, which is an ingredient used in many bakery version. She made several of these every year, one for everyone in the family. This was her favorite dessert for Easter to make and everyone raved about this cheesecake. A classic traditional cheesecake most Italians make every year at Easter with ricotta cheese, fruits, and chocolate. Not like a traditional french cheesecake with cream cheese, this is much lighter and moist. I have cut the recipe in half for years, now the family is growing and I make the whole recipe! This is a very close duplicate of her eagerly awaited cheesecake from everyone every Easter. It's hard to carry on tradition without her but she is her guiding me through it every year in spirit. The chocolate and cherries are the perfect combination of flavors in this cassata cheesecake. It's creamy but now overly sweet. The cheesecake is very rich and you only need a little piece. I usually make two good size ones and freeze one for another time. It sure is a treat and well worth the wait to enjoy every Easter. I will always carry on her tradition. The crust is more like a cookie crust than a pie crust. It's sweet and soft and goes perfectly with this filling. As the crust bakes, it has a nice shine when brushed with a beaten egg on top. The recipe makes at least 4 deep dish trays. I prefer a thicker crust so double the recipe for the crust. Spray your tins generously for easy removal or whatever baking pans you use. Citron was not a favorite but an ingredient used often in cheesecake, I left it optional. Don't stir the batter after the cherries are added or the whole batter will turn pink, fold gently. 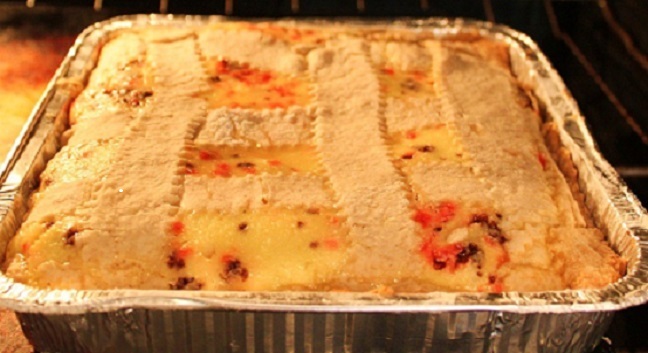 Cassata is moist and needs to be, kept refrigerated. 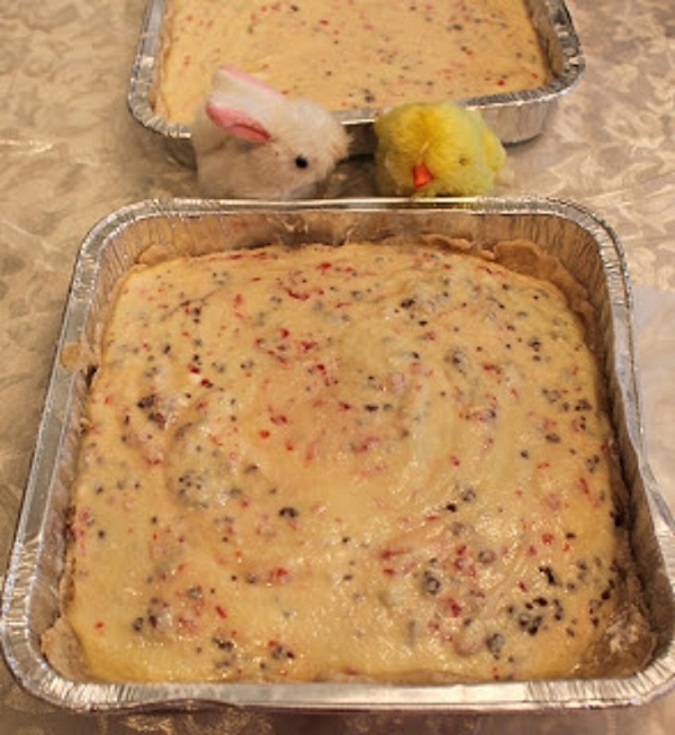 Cassata will freeze well, just defrost in the refrigerator overnight. This ancient queen of Sicilian pastries, we cannot leave behind her sister, the Cannoli. One of our favorites to also make around Easter time. That is a hard pastry is fried by immersion, preferably in the extra virgin olive oil, the cornerstone of Sicilian quality products, which type of frying makes it crunchy and fragrant. If you are looking for a cannoli recipe you can find mom's here. One other pastry on our table will be the PASTACIOTTI which here in the United States (my hometown Utica, New York) you will find in all the famous bakeries. This is a delicious pustie is a famous pastry crust filled with various flavored puddings. Buona Pasqua, which is Happy Easter in Italian. This is a very moist Italian style cheesecake made with ricotta cheese, chocolate and fruits all baked into a cookie-like crust. This is a traditional cake made at Easter. Mix eggs for four or five minutes, add sugar and vanilla, mix well until light in color. In a separate bowl beat ricotta for a few minutes, then add chocolate mixing well. Add this mixture to the eggs mixture and fold in chopped cherries and citron. Spray pays generously with cooking oil. Line a deep dish pan with this rolled out dough. Bake at 325 for 1 hour or up to 2 hours depending on how big and thick this is, check the middle with a toothpick method, and that the tops in the center are puffed up not sunken. TIP: If tops begin to brown too quickly drop oven temperature to 300 foil wrap around the edges to keep from cooking further. Mix everything together, the dough will be very soft, you will need to keep adding additional flour so it doesn't stick while rolling. Roll out to fit tins to fit for the bottom. Use remaining dough to make strips like tic tac toe effect on top. Brush with beaten egg wash for the shiny top. Note: I double this crust recipe for the filling. If you like a thinner crust, this recipe can make two squares around 10 x 10. If you like a thick crust you have to make a double batch of dough for the whole filling recipe. Don't forget to try the mini version of Cassata! What a wonderful recipe to have from your mom! I know my family would love this..I'm a little intimidated though, I'm not good with crust. 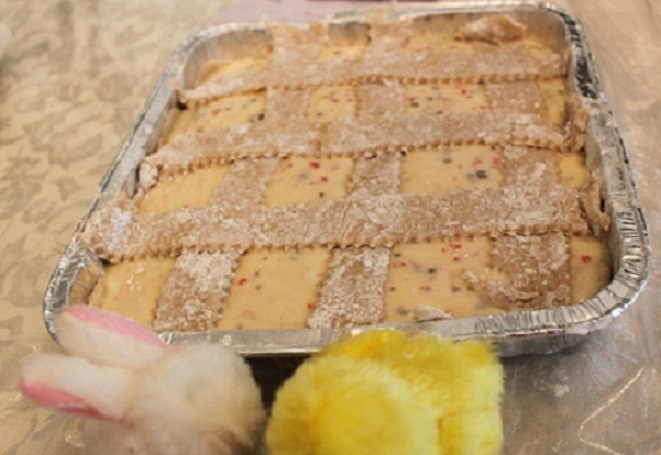 I wish I had time to make it for Easter but I'm already trying to make the Easter bread and that's hard enough for me! :) I will hold on to this and try to make it for my next family gathering. Enjoy your cheesecake this weekend!!! Family recipes are always the best! Ahhhhh yes! !This looks VERY familiar. You forgot to mention how lovely it smells when it's baking. This tastes and smells like every Italian grandmother's Easter kitchen! Nothing like tradition during a holiday. I bet this cheesecake tastes great. I'm making a cheesecake for my family this weekend. Have a wonderful Easter! I love recipes that are handed down through families. We are all so lucky to have you share this with us! Happy Easter Claudia! This is a wonderful recipe made all the more special because it is from your Mum. I have a friend from Sicily who makes a similar recipe for Easter...so it is wonderful to have this recipe. I am so glad to you visited my blog and commented on my Pastiera di Grana from Campania. I'll be back for more of your lovely recipes. The recipe of your mom is wonderful, I like it, especially the addition of chocolate! What a great family recipe! Must be your favourite recipe. Looks fantastic! Happy Easter Day to you & your family! Thereare never enough ricotta cheesecake recipes. I will try every one that comes my way. This looks beautiful, Claudia. Buona Pasqua! Ooh that looks so delicious! What a beautiful creation! 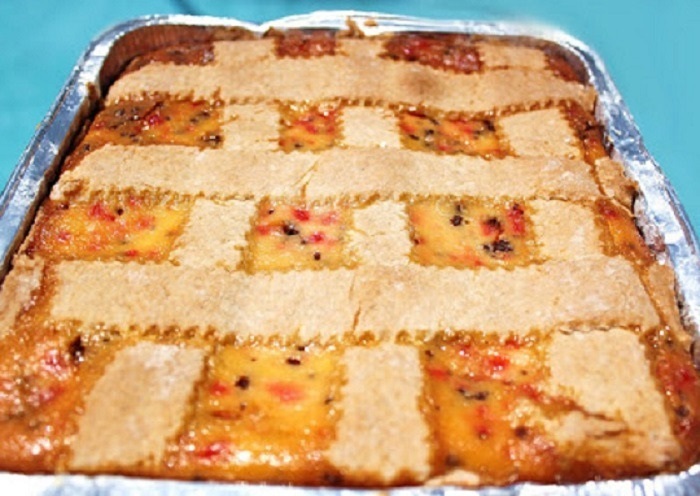 So beautiful with the lattice crust...and a nice memory of your dear mother with every bite. Happy Easter, Claudia! 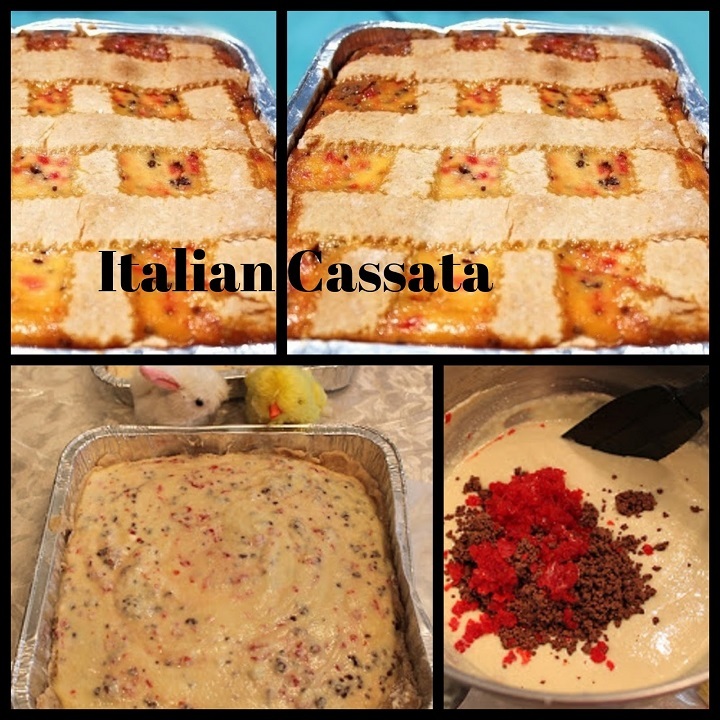 Your traditional, beautiful Easter Cassata reminds me of the Alla Cassata Siciliana which I have not made in a long time, but it has the same filling, but made in a round cheesecake form. Thank you for sharing your sweet mom's recipe. Always wonderful to have a special recipe from Mom :) This sounds so wonderful. Happy Easter! Your mom's recipe is AMAZING! Happy Easter!!! I love the simplicity in making this but it is so flavourful! Is that really a half recipe you posted? I think I will tuck this one away for the next potluck! I just halved the recipe posted...and made two alterations...first of all "Citron"is boiled lemon peel...but...wasn't sure why it notes the amount in ounces...so I was thinking citron as in lemon flavored vodka??? anyway, I substituted lemoncello liquor (2 oz) with a spalsh of citron...and then I also added lemon zest to the crust... also I was able to pour the mixture into a 9" springform pan with halving the crust recipe as well and pressing into the bottom of the pan, partially up the sides (did not have extra to lay in sections across the top)....it smells so good!! I did have to reduce the oven temp to 300 after 1.5 hours and covered the top with foil to continue baking....it looks so wonderful. 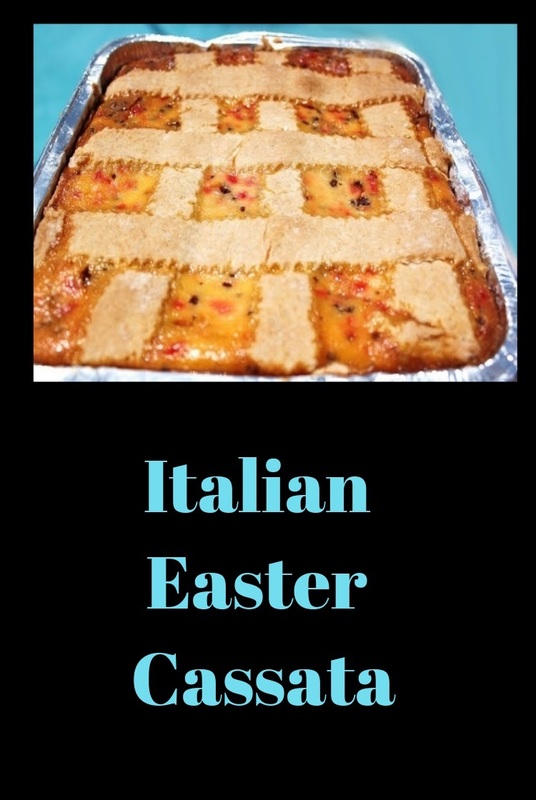 This recipe is a bit different from my Sicilian grandmother's recipe, but thought it sounded so good and perfect to try for this Easter. I will update with final results once sampled. Thank you for sharing!! What a wonderful tradition and recipe you have inherriated from you mom. Great family recipe. Looks so good. I make a cassatta every year. I use a dough you pat into the pan. I love the chocolate and cherries, two of my favorite flavors, although I would use fresh cherries not the candied ones. This sounds lovely! I'll definitely be trying this recipe. I'm going to ask my 95 year old Italian Father-in-Law if he's heard of it? I like cooking him dishes his mother made.